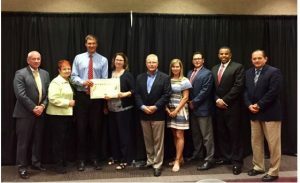 Worcester County Sheriff Lewis G. Evangelidis and Worcester County Sheriff’s Office Superintendent David Tuttle along with WCSO employees Diane Cook, Kimberly Roy & Dominic Barbara receiving their certificate of accreditation from American Correctional Association (ACA) Officials recently in Minneapolis, Minnesota. The Worcester County Sheriff’s Office received 100% compliance for all mandatory standards. West Boylston- Worcester County Sheriff Lew Evangelidis has announced the Worcester County Sheriff’s Office has successfully completed all the requirements for Re-Accreditation from the nationally recognized American Correctional Association (ACA). Earning 100% compliance for all mandatory standards and 98.4% for non-mandatory standards. Built in 1973, the Worcester County Jail & House of Correction is the oldest county correctional facility in Massachusetts. Due to the inherent structural and square footage limitations of an older facility, physical plant waivers were awarded by the evaluation panel during the accredidation process. The American Correctional Association founded in 1870, is the oldest and largest correctional association in the world. Their mission is to provide professional organization to departments that share their goal of improving the justice system. In order to meet the criteria for this award, the department had to be in compliance with 384 stringent standards evaluated through a series of reviews, evaluations, an extensive audit and a formal presentation to the ACA panel. The required standards focus on issues ranging from inmate care and safety, discipline, health care, education, fiscal efficiency, program development, officer training, and facility administration. Agencies that are accredited must be re-accredited every three years to maintain their status. As the last requirement to complete the re-accreditation process, the Sheriff’s Department presented before the national board in Minneapolis, Minnesota on Saturday, August 4th. “The feedback during our presentation was excellent, they were very impressed with our operating procedures especially in light of the numerous facility challenges that are inherent in operating the oldest county correctional facility in Massachusetts,” said Superintendent David Tuttle. “When I took office I made a commitment to increase professionalism at the Worcester County Sheriff’s Department including adhering to the highest industry standards with successful reaccreditation being imperative to reaching our goals. I am proud to say, our department is now one of the finest in corrections today. We will always continue to strive for excellence” said the Sheriff. The American Correctional Association has been accrediting public safety agencies since 1978. According to the ACA, benefits of accreditation include: improved staff training, increased safety of staff and offenders, assessment of program strengths and weaknesses, reduced insurance liability costs, and increased staff professionalism and moral.